Anyone with a fondness for cemeteries will know what I'm writing about. You visit a sacred place -- maybe it's a single tombstone, or maybe it's a family lot -- and you can't help but feel a tug of emotion. Nothing too crazy, mind you. A lot of times I simply and softly utter, "Wow." Something moves you enough that you can't simply pass by without acknowledgement. This happened when I visited Ida Herring and Leonard Wilson Moore at Mt. Olive Cemetery in the Pinehurst area of Dooly County, Georgia. Ida (d. 1949) lived to be almost 73, and Leonard (d. 1955) almost 89. But not long after they came together (about 1896-8? ), they began losing children. At least eight of them were buried in the family lot at Mt. Olive. Yep. I typed eight. Ida and Leonard buried two children in the year 1900, a daughter and a son. Ida even gave birth to two sets of twins (isn't that rare? ), three girls and one boy. Those three daughters all died young. One set of twins, girls who lived less than a year, not only have the same birth date, but also the same death date. Since it was 1918, I can't help but think of the influenza pandemic. Luther Moore, found in 1900 census and cemetery, b. 28 Oct 1898, d. 11 Jul 1900. Imogene Moore, found in cemetery, b. 29 January 1900, d. 25 February 1900. Seth H. Moore, found in 1910, b. abt 1901 (could be one of two infants at cemetery). Elijah F. Moore, found in 1910 & 1920, b. abt 1903. Lulu/a Moore, found in 1910 & 1920, b. abt 1904-5. Margaret "Maggie" Moore, found in 1910 & 1920, b. abt 1906-7. George Moore, found in 1910 & 1920, b. abt 1907-8. Charley/ie H. Moore, found in 1910 and cemetery, b. 12 Dec 1908, d. 12 Aug 1910. Vand Lee Moore, found in 1920 – 1940, b. abt 1910-14. Paul Moore, found in 1920 & 1930, b. abt 1915. Paula Moore, found in 1920 and cemetery, b. 4 Aug 1914, d. 20 Jan 1921. Martha [C?] Moore, found in cemetery, b. 28 Jan 1917, d. 23 Jan 1918. Mary [L or E?] Moore, found in cemetery, b. 28 Jan 1917, d. 23 Jan 1918. So counting the two infants at the cemetery, of which Seth could be one, Ida Herring and Leonard Wilson Moore appear to have had fourteen or fifteen children. More than half did not see seven years on this earth. This of course begs the philosophical question of why did some children die? Why did some live? And that's why A is for Arbitrary. Note: Assumptions aren't always accurate! At least one was made in this post. If I've royally messed up the list of offspring for Ida and Leonard Moore, please let me know. Great theme. I loved your post. I totally get the sacred-awe feeling about being in a graveyard. Thanks for sharing. Thanks for stopping by, Jo-Ann! I'm off to check out your space. It's so sad to see the graves of children and babies, particularly when so many come from the same family. One of my pictures of such a grave was used in the widely-shared "Childhood Before Vaccines" meme. It seems some of those kids died of cholera and diphtheria, since their death years correspond to pandemics for those diseases in Pennsylvania. Wow, I admire your eye for detail and research! It's really sad to see so many children die, must've been hard on everyone. I can only imagine, Miss Andi. Thanks for stopping by! Congratulations on your A post. Looking forward to following along. Finding tombstones from any era never fails to move me. I've learned an interesting fact that you may or may not have heard. Apparently, lifespans were generally long once a person got out of childhood. It's so sad that many young ones never survived. Makes me grateful to be alive. 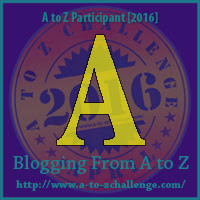 I'm glad to have discovered you on the A to Z challenge! Thanks, Darla! Heading to your space now! I always enjoy how you portray your graveyard discoveries. I took the most amazing course last year taught by Gill Blanchard, on cemetery/burial records and it left me with an appreciation of this kind of research, especially when it's done well. What an interesting theme for the A to Z Challenge! I'm always amazed at how many children people used to have, back in the "olden days," but I guess if half of them wouldn't survive childhood, it was probably a necessity. My dad comes from a big family, and grew up on a farm, so it seems they were usually building their own little army of workers to keep the place running. Very interesting! We have much to be thankful for these days with modern medicine assisting infants getting through their early lives!